Yohaan Dalal is a 17-year-old boy studying in Grade 12, at Indus International School, Bangalore. 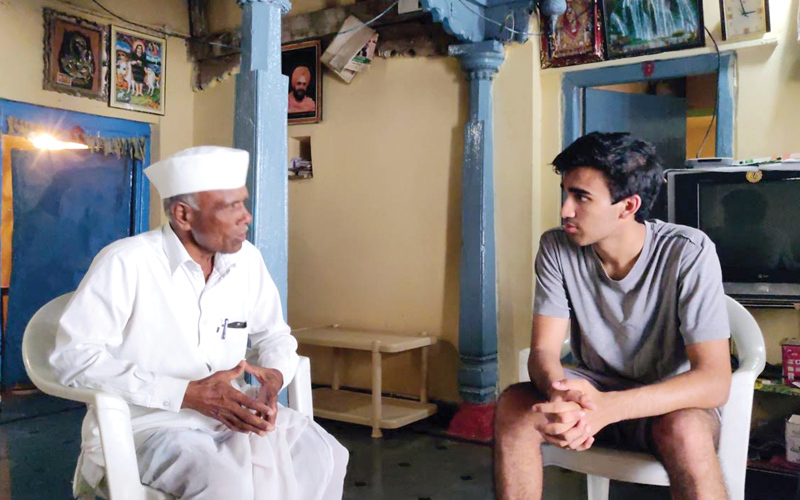 Driven by his desire to understand poverty, he spent a week in a remote village called Anthwar in rural Telangana. In an attempt to empathise with the poor and see things from their perspective, Yohaan lived on just Rs 100 a day. He has written a book called Hundred Rupees a Day – My Quest to Understand Poverty, which is available on Amazon. Quite frankly, a fear of poverty and witnessing the struggles of the less fortunate made me passionate about wanting to help the poor. As I began to think about how to do this, I realised that my biggest obstacle was the lack of understanding as to what it truly means to be poor. “How could I find a solution if I didn’t know the problem?” I wondered. As a result, I came to realise that I needed a thorough and accurate comprehension of poverty. With this desire arose the radical idea to learn about the poor by temporarily being poor; an idea which led to a journey that changed my perception and added value to my life. How did you arrive at the Rs 100 per day amount? Although the line of poverty recognised internationally is $1.90 a day, I decided to live on 100 rupees a day (roughly $1.45). I chose this amount because of convenience and the high purchasing power of the Indian rupee in a rural setting. With this money, I would have to take complete care of myself: food, shelter, etc. In the context of my expensive lifestyle, Rs 100 is not even enough for a drink, let alone an entire meal. This posed an exciting challenge wherein my temporary financial situation was closest to what the poor had to deal with. What were some of the hardships you faced? Given the sudden change in the environment, it took me a while to adjust and with this came numerous hardships. Quite frankly, procuring basic necessities of food and water was quite strenuous. Another hardship I encountered was communicating with the locals as there was a language barrier. While I received help in translating, getting my point across and understanding their’s was challenging at times. These hardships exposed me to poverty and tested me, but more than anything, they made me realise that there are so many things we take for granted. Clean drinking water, fresh clean clothes, and nutritious food are some of the many things that I came to value after my time in Anthwar. So what did you learn about poverty? Of the many discoveries and lessons, a few overarching themes persisted. I came to realise that while poverty is a financial situation, it’s also a mental obstruction. To that end, I perceived a lack of emphasis on mentality reformation in anti-poverty programmes. Additionally, I understood the importance of community in rural livelihood. Even though I was an outsider, I felt at home in the hospitality of the Anthwar community. They supported each other in every way and this collaboration, I came to realise, is crucial in the climb out of poverty. sustainable and would be effective as the poor (of Anthwar) have the demonstrated ability. Another prevalent finding was that poverty is a cycle which can only be broken through education. realise the vital role of education in broadening possibilities for the growing generations. Through education, children are equipped with not only vocational skills, but also gain clarity of themselves, their community, and how they can solve large-scale problems whilst earning money pursuing their passions. While these are some of my key findings, there remained many more which reached me in various ways.